Human sounding speech synthesis via Ethernet, in an industrialized enclosure. Seamless integration, simple operation. Real-time voice announcements generated directly to speakers from text via WIFI data. The system supports 25 languages and instantly converts text and data to a high-definition, natural sounding voice. The unit can feed line level audio into existing PA systems as well as directly connecting to local speakers via the 25 Watt amp output. 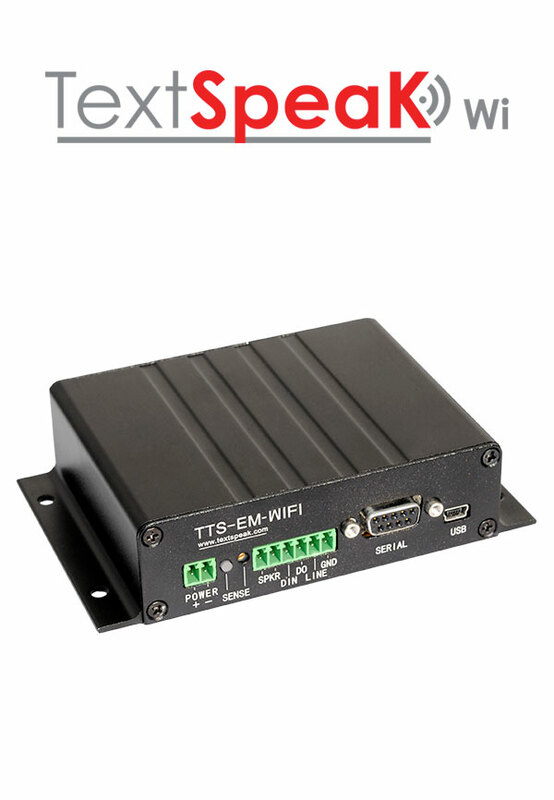 The TextSpeak Wi Device Amplifier can be purchased as a standalone unit for integration into existing or new mass notification systems. It is also included in the TextSpeak NOTIFY! WiFi System as part of an out-of-box notification system that includes the TextSpeak App software. The TextSpeak Wi Device Amplifier offers a complete Text to Speech platform with a high definition 25 W audio paging amplifier. Integrated ambient noise detection optionally allows a 12-20 db SPL ALC (Automatic Level Control) meeting customer demands for clarity in environments with dynamic noise activity. Typical deployments include buildings, industrial, retail, offices, transportation centers and military installations. WiFi connectivity offers simple setup, management and control via TCP/IP packet data. Text to Speech generation includes support for dictionary management, in-line control codes and dynamic language and voice switching. 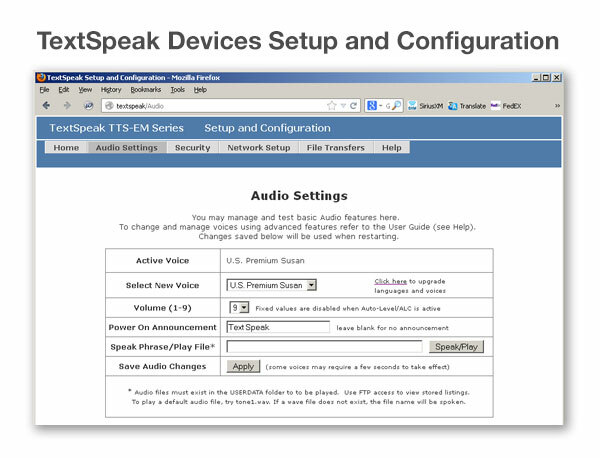 Simply connect your TextSpeak Wi Device Amp via the USB port to your computer, connect a test loudspeaker and power up. The unit speaks it’s IP address so just enter the address into your browser to access the simple setup software for your amplifier. Related TextSpeak Device Amps and TextSpeak NOTIFY!